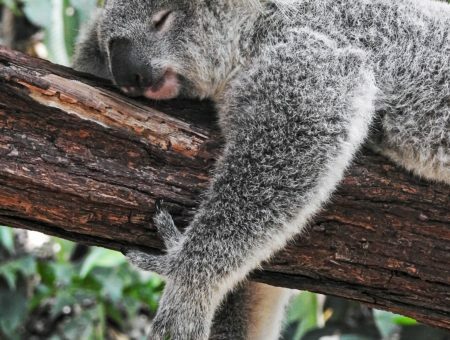 I’m pretty ambivalent about Valentine’s Day: while I’d welcome the idea of a Prince Charming sweeping me off my feet, I’m also pretty okay with sitting in bed at home. Any ice cream I eat will be because ice cream is amazing and wonderful, not to reenact the SNL “Someone Like You” skit with Emma Stone. Last year, I showed you Valentine’s Day outfits inspired by my favorite fictional heroines. This year, try out some fashionable inspiration from three of my favorite fictional couples and their epic romances. She’s an immortal elf princess torn between two worlds. He’s a rugged Ranger hoping to regain his rightful spot on the throne. For a Valentine’s Day outfit inspired by this Middle-Earth match, combine elements of both Arwen’s ethereal gowns and Aragorn’s hardier garments. 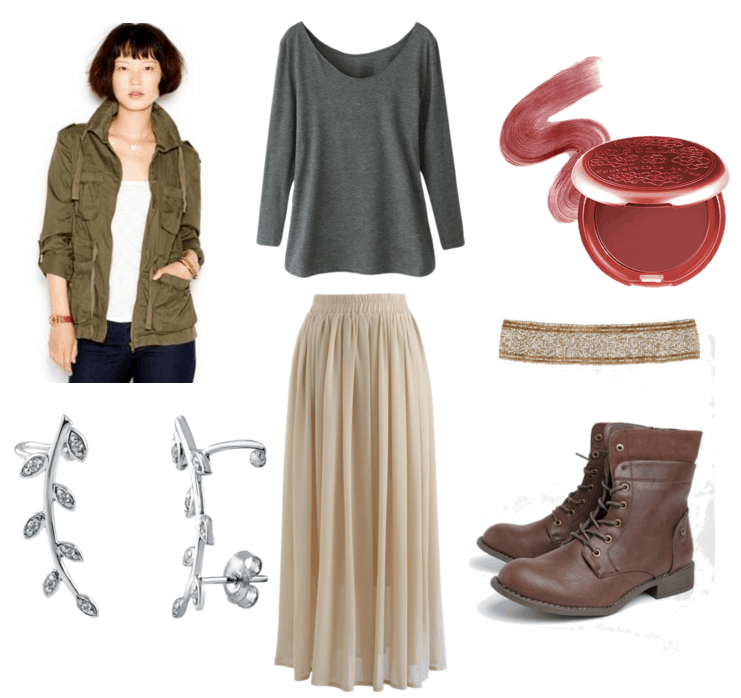 Tone down the sweetness of a billowy chiffon skirt with a simple gray top and a sturdy cargo jacket. Combat boots ground the look, while a pair of delicate vine ear cuffs and a shimmery beaded belt add an elegant elven touch. Lastly, pat a berry stain onto your lips and cheeks to emulate that Elvish glow! She’s a whip-smart senator who happens to be a princess. He’s a scruffy-looking nerf-herder who happens to be a notorious smuggler. No article celebrating geeky iconic couples would be complete without Leia Organa and Han Solo! (Although those who have seen The Force Awakens may find this rather bittersweet.) Despite an initial clash of personalities, the headstrong princess and the cocky pilot overcome their differences (and egos) to work together to defeat the Empire. Result? A love for the ages. While Leia might be most recognizable in the long white gown and side buns that she wears in A New Hope, she also wears a number of practical outfits much better suited to the battleground (battlespace?). Try out a trendy quilted bomber jacket reminiscent of the flight suit she wears on Hoth with some black jeans and knee-high boots not unlike the ones worn by Han Solo. A blush-colored wrap top softens the look. Finish the outfit off with a fun braided hairstyle! She’s the Avatar, master of the elements. She’s a savvy businesswoman, engineer, and pilot. Although hot-tempered Korra and rational Asami might not seem like the most obvious match, their contrasting personalities and skill-sets create balance in their relationship. Even in her darkest hours, Korra knows that she can depend on Asami for guidance and emotional support. Heading for a night out in Republic City with your significant other? Pair a cerulean blazer with a flirty burgundy dress for a bold contrasting color-blocked effect. 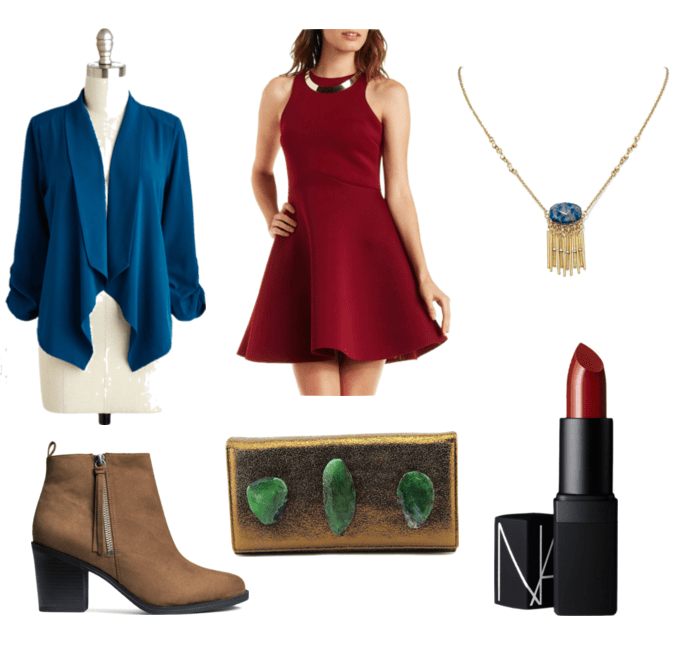 Accessorize with a trendy tasseled necklace reminiscent of Korra’s Water Tribe pendant and a striking metallic clutch studded with gemstones the color of Asami’s eyes. When it comes to classic Valentine’s Day beauty looks, you can’t go wrong with red lipstick! Would you wear these outfits? Who are some of your favorite fictional couples (geeky or not)? Did you like my corny rom-com taglines? Tell me everything in the comments.